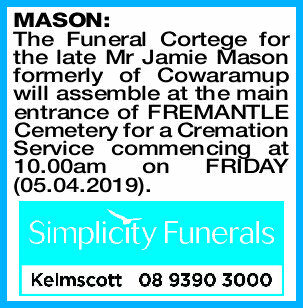 The Funeral Cortege for the late Mr Jamie Mason formerly of Cowaramup will assemble at the main entrance of FREMANTLE Cemetery for a Cremation Service commencing at 10.00am on FRIDAY (05.04.2019). Deepest sympathy to Bianca, Brody, Laura and family. Fond memories.